So this is a very last minute post. Very last minute, indeed! I know I've been filling your minds and bellies with sugary, buttery, chocolatey treats, and believe me that will continue, but because you know I love my bagels, I need to give a quick shout out about my favorite breakfast spot. Bruegger's, which you've surely heard me mention before, is giving away FREE bagels. See? This is their way to say Happy Holidays and Thanks to their loyal customers and Bottomless mug holders. Today. 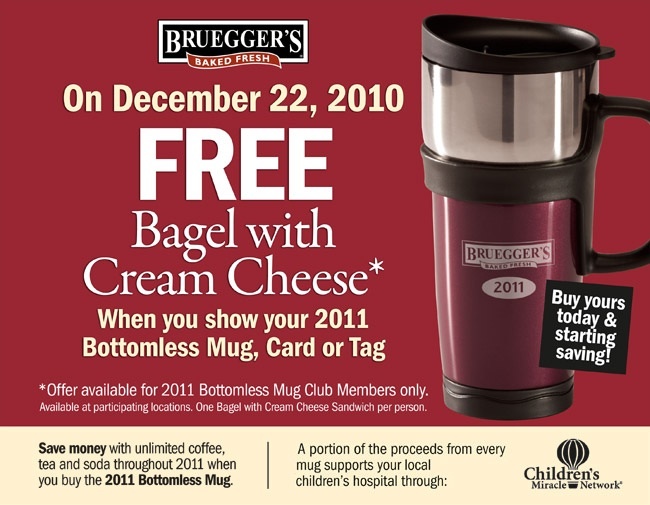 December 22nd, any person with a 2011 bottomless mug can show their mug or key fob at the counter and receive a free bagel and cream cheese. 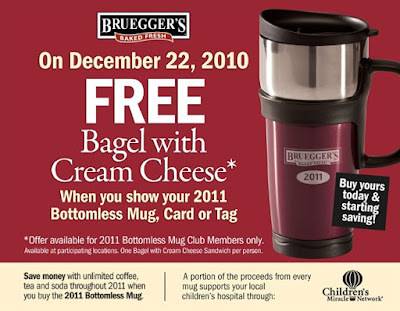 If you don't already have your mug, buy one todayand receive your bagel and cream cheese on the spot! This isn't just free pub...Bruegger's has partnered with Children's Miracle Network and is donating a portion of every mug sold to the local Children's Hospital wherever the location. Think of the kiddies. And free bagels. Sugary cookies comin' atcha tonight!